So here’s what we started with. K doing the slow-exhalation-when-will-my-shirt-be-done thing. I hacked the sleeves shorter. A little longer than I’ll need in the finished product, but I needed something to hold on to as I pull this under the presser foot. Two strips of 1/4″ elastic the length I want the new sleeves to be. Turn the shirt inside-out. I ironed a crease into the shirt sleeves so that I’d have a line to follow while stitching. You could also use a water soluble pen to mark it. The machine part is kinda impossible to photograph without three hands. 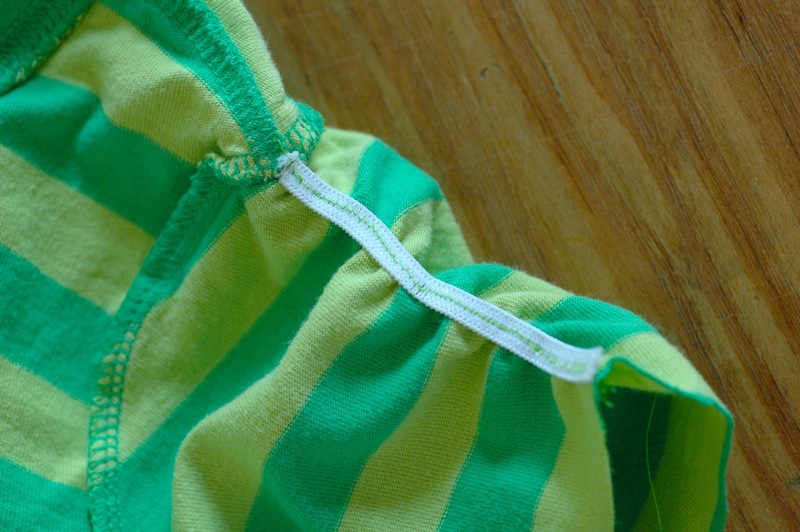 Start by tacking the elastic at the starting point and once it’s securely attached to the shirt, pull the elastic out to meet the end of the shirt sleeve and hold those together firmly. Stretch stitch down the length of the elastic. 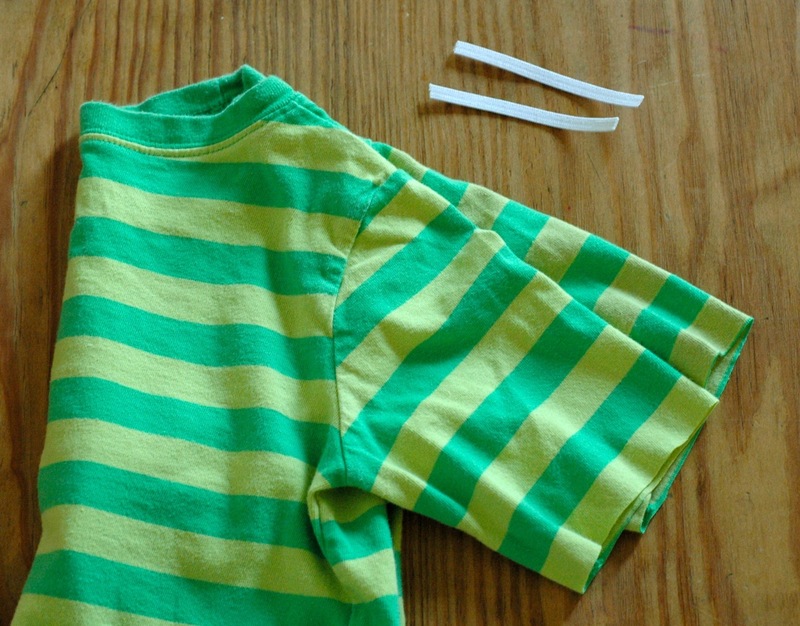 You’re basically pulling from both directions and also watching to make sure you’re not catching any other parts of the shirt in the stitches. Since K was quite literally breathing down my neck, I didn’t bother trying to finish the edges. I’d been thinking about doing this to a few boxy-sleeved tees of my own. Now I realllly want to do it. So quick to do! It makes winter clearance racks/thrift store winter stuff a little more interesting when it’s 90 outside. Completely unrelated to cute sleeves, we have an update about Skirt Week Prizes. First of all, as far as crafty prizes go, they’re pretty awesome. Second of all, we’re going to wait until Tuesday to post the sponsors as we still have a few that need to get images to us. Please don’t spend all weekend moping. Enjoy your holiday! And when you need a pick-me-up to escape post-holiday-weekend-blues, we’ll be all over it. What a cool idea ~ literally! ; I especially like the idea of turning some of the really cheap long sleeved shirts I see on clearance into new shirts for summer. Nice! Hacking sleeves shorter is something I already did a couple of times, but I never thought of using elastic. Now I am thinking about doing not only this, but making some poofy sleeves too. Fun! I am going to spend my weekend moping. It’s all on you. No, not skirt week… our weather? it’s like raining and 12 degrees Celcious for the next five days. Um, it’s nearly June, Weather, let’s try keep it together, shall we? I keep reaching my witchfingers towards the longsleeves for projects like this and then recoiling with a hiss as I look at the miserable weather outside the window. Awfully cute! Even a mama could renew a T with that idea! What a cute & simple fix! I love it and may try it on some of my shirts. Thank you! I’m pinning this idea. I love how simple and perfect this idea is! Thank you! great idea! 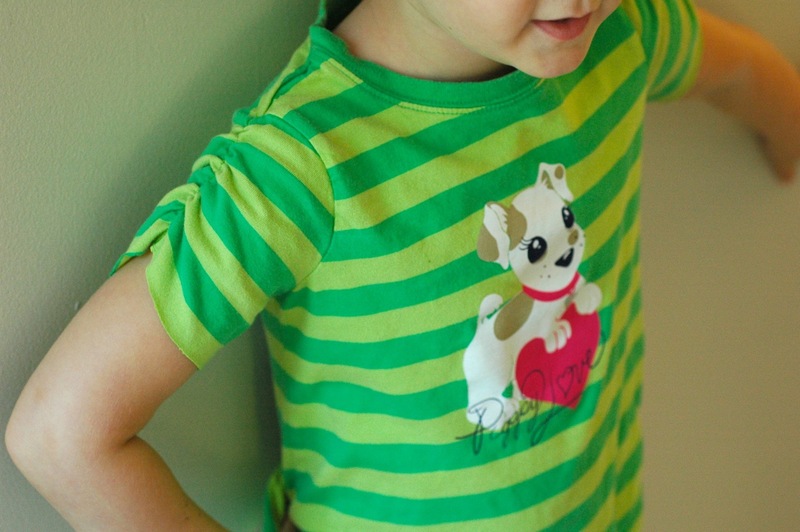 i did something similar to a too big shirt of mine except i used elastic thread and did one row of shirring down the sleeve, it looks the same as your daughters sleeve on the outside. Thank you. 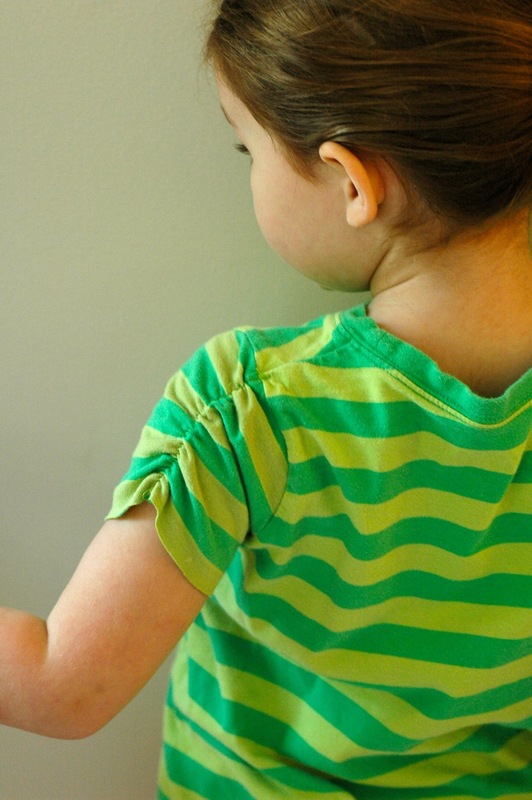 Just this morning my daughter wanted to wear her long sleeve rainbow dress but it is just too hot. I am going to do this so she can get another season out of it. Very cute! I was just playing around with this elastic trick the other day. Looking forward to skirt week! I have a couple of skirts that I am planning to make so it will be great! What a clever idea ;) makes me want to hit the clearance racks!! Thank you! awesome idea! i never thought of making the sleeves cute, haha! Oh, I am about to do some sleeve hacking for my daughter. Only problem? Raglan sleeves. Not sure the elastic would work with those. Thanks for a great tutorial! 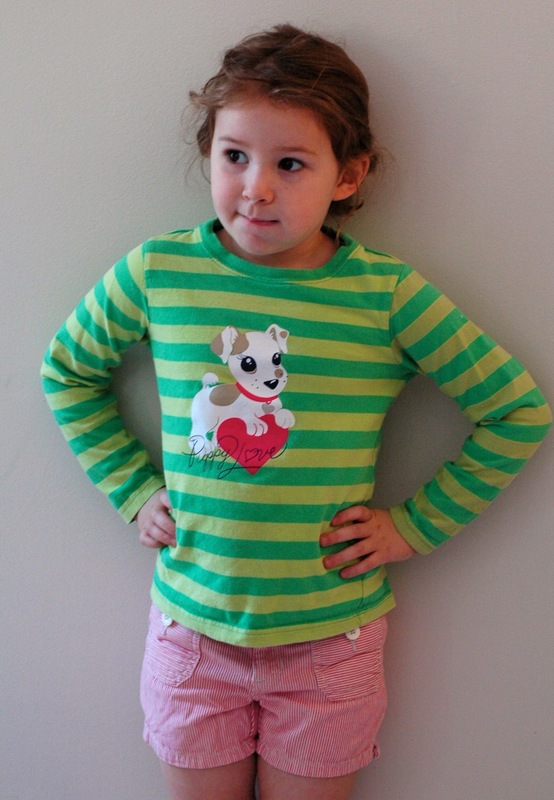 I have cut the sleeves off of two of my daughter’s shirts so far and mentioned your tutorial in my post about it. Do you think this would work if I used elastic thread (used for shirring) and made two lines in the sleeve? Jenni– yep, I think so. It’s also great for the long sleeves that are a little too long. I just tried this and it worked. Thanks! I’ve both gathered and shirred sleeves to get this same look, but I have to say, I love this idea MUCH better. I think you just saved me lots of headache in future projects.